Spain Facts For Kids | Cool Kid Facts . Spain is a popular country to visit. 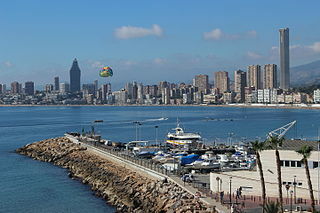 It has beautiful cities, interesting countryside with mountains, beaches and a warm climate in summer. The Spanish people love to relax. Their lifestyle is very easy going. Size: 505, 955 sq. km. Lowest Point: Atlantic Ocean 0 m.
Highest Point: Pico de Teide (Tenerife) Canary Isle. 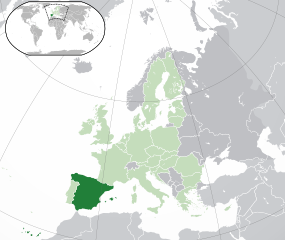 Spain occupies 80% of what is known as the Iberian Peninsula. North of Spain is the border with France and divided by a natural boundary of the Pyrenees mountains. Spain includes the Canary Islands and Balearian Islands. Spain is a Mediterranean country with a climate that is cold on the mountain slopes with snow and very hot in the lower regions where the temperature can range from 25 – 30o C.
In the wild life areas there are some big mammals like brown bears, wolf, lynx, wild boar, deer and the Spanish ibex. Spain is the home of many bird species. Spain has the largest number of reptiles amongst the European countries. 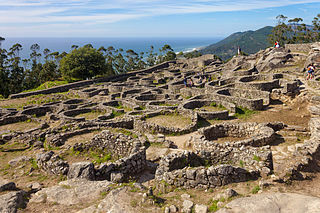 In prehistoric times Spain was inhabited by various tribes of people that travelled across from Africa. These tribes left many archaeological evidences of their occupation in Spain. After this era Spain was under the rule of the Romans. After the fall of Rome, the Visigoths tried to take over and unite Spain. However, their leaders quarrelled and some of them decided to ask the Muslims in Africa for help. The Muslims crossed over from Africa, but defeated the Visigoth King Roderigo. The Muslims brought medical knowledge and ideas about astronomy to Spain. In 1250 Spain converted to Christian rulership, except for the Nasrid Kingdome of Granada. When Isabel I of Castile and Fernando II of Aragon married in 1469 Spain was united and in the reconquest of the country Granada was taken too. During the years 1504 – 1700 Spain was ruled by Catholic monarchs. A this time Christopher Columbus set sail from Spain and discovered America. One of the new rulers from the House of Hapsburg, Charles V of Germany, became Charles I of Spain. He set up the Spanish Inquisition which included a court that decided if a person was a true follower of the Catholic faith. Many people were killed even if they were innocent. When King Charles dies the Hapsburg, dynasty ended. During the reign of the next king, Felipe V of Bourbon Spain lost some of her provinces, but this was a time of enlightenment for Spain. England occupied Gibraltar. France joined with Spain, but they were defeated at the famous battle of Trafalgar. A naval battle was also fought against Great Britain. The first Spanish Republic was declared in 1868. This time was known as the Restoration. In World War I Spain stayed as a neutral country. In 1923, the election was won by the socialist party. General Primo de Rivera took over the country but he was a dictator. A time of civil war was experienced, and General Franco became the next dictator. Spain stayed out of the next world war and in 1947 the dictator Franco announced that when he died, the country would return to having a king. The new king, Juan Carlos, made sure the country had free democratic elections and a new constitution. 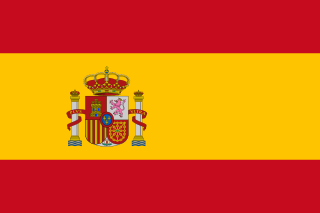 Spain became a parliamentary monarchy in 1978 and joined the EU, and joined NATO in 1982. The most important industry in Spain is the tourist industry. Spain is the third most popular place to visit after France and America. Spain has 60,6 million people visit its tourist attractions every year. Spain offers beautiful beaches along the Mediterranean like the Costa Brava and the Costa Dorado Great cities like Seville and Barcelona attract visitors. The rest of the economy has made slow progress. Only 8,3% of the work force is involved in Agriculture. Industry has 29,9% of the workers and 61,8% of the workforce is involved in the service industry. If you add all those figures you should reach a total of 100%! Spain has a few export goods, but they have to import vehicles, chemicals and machinery. The road and rail system are efficient. The tourist industry benefits from these services. The Spanish culture is a rich culture. Many types of people that have had an influence on Spain. There are all sorts of artistic activities to enjoy from art, music, theatre and dancing. The Spanish are well known for a distinctive style of dancing, the Flamenco and you can learn to dance the Fandango. The Spanish love Fiestas or holiday celebrations. Easter is a popular festival as well as the Falls Bonfire festival held in Valencia. Seville hosts the April fair and the ‘Running of the Bulls festival, suited to the young men of the community, takes place in Pamplona. Spanish people love life! They enjoy eating with friends and starting a meal with Tapas or Pintxos, traditional appetisers. They enjoy music and dancing and the national sport is football. 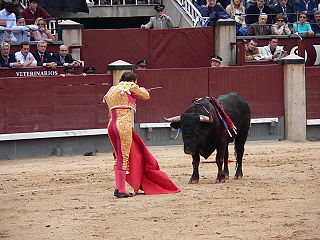 Bull fighting is a sport that is part of the Spanish culture. It is not a sport that everyone supports because it is a ‘blood sport.’ The matadors dress in very colourful outfits and parade round the bull ring. They have a strict code of behaviour. Originally bull fighters rode on horseback, but now they walk on foot around the bull ring. Hermando Cortes was a Spanish Conquistador and he led the expedition to South America that crushed the Aztec empire and started the colonisation of South America. 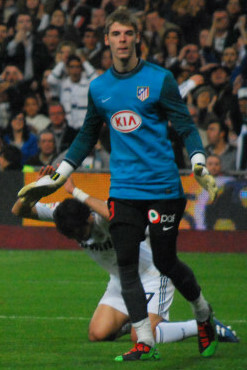 David de Gea is a famous Spanish footballer. It is difficult to pick a famous player because there are so many, but de Gea is known as one of the world’s best goal keepers who played for the English soccer club Manchester United. Antonio Banderas is the actor who played the masked swordsman in The Mask of Zorro. He is an actor, director, producer and a singer. Penelope Cruz is an actress from Spain. She starred in the Pirates of the Caribbean and studied classical ballet for nine years before becoming an actress. Pablo Picasso is one of the most famous world artists. He started painting when he was eight years old. He was also a sculptor, ceramic designer, and known for Cubism, a form of modern art. Other famous artists from Spain were Goya, Miro (accent on the o) and Dali. Enrique Iglesias, the son of Julio Iglesias is a singer and songwriter and the bestselling Latin recording artist. Spanish people know how to relax. Generally, they spend sixteen out of the twenty-four hours in a day resting, eating drinking and sleeping. A laid-back style of life. The first stapler was made in Spain. This special stapler was made for the French King Louis XV and each staple had the royal emblem engraved on it. Spain produces over half the world’s olive oil. More than 1,5 million tons. The restaurant Botin claims to be the oldest restaurant in the world and has been open since 1725. The dish it serves as its signature dish is still the same – roast suckling pig.